Last month, my family took a day trip to Norwich from our home in Shelburne. Our main destination was the excellent Montshire Museum of Science, but we stopped for an early lunch first at the King Arthur Flour Bakery and Café right down the road. The sandwiches were delicious — I had an interesting pulled pork and kale concoction — and an ample kids' menu made ordering easy for Mira, 6, and Theo, 4. But the pièce de résistance was the spacious baker's store, filled with all sorts of pans, utensils and ingredients. One of our favorite purchases was a miniature doughnut pan — basically a muffin tin with little raised nubs in the middle of each hole. Doughnuts aren't exactly the healthiest breakfast choice, but I justified the purchase by telling myself that these ones would be baked instead of fried, kind of like muffins but cuter. 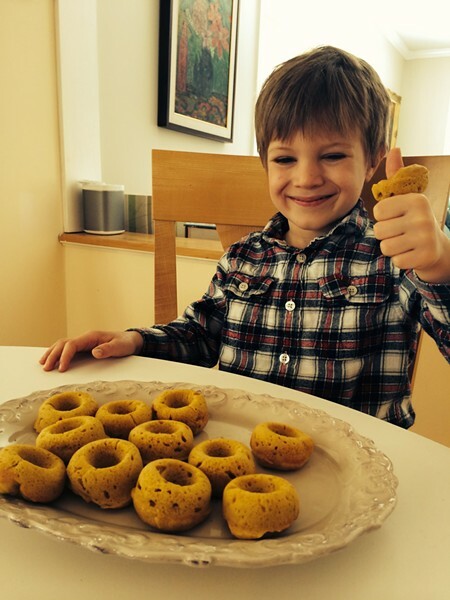 This week we gave the doughnut pan a whirl with a recipe for pumpkin cake doughnuts straight from the King Arthur Flour website. Our doughnut pan only makes 12 small doughnuts, which doesn't go far in our house, so I used a 24-cup mini-muffin pan for the remainder of the batter. How did the small sweets taste? Theo's doughnut-ringed thumbs up said it all. Preheat the oven to 350°F. 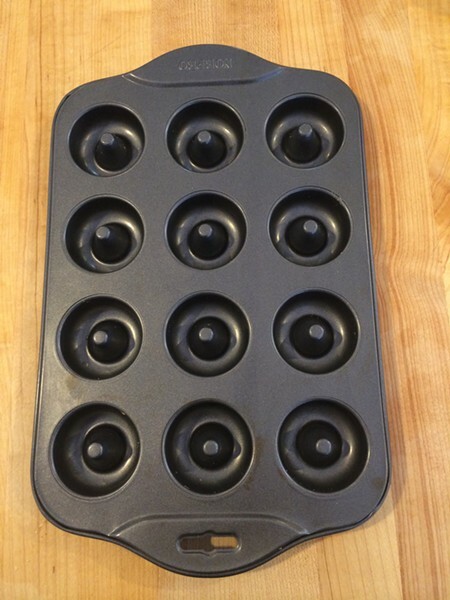 Lightly grease mini-doughnut or mini-muffin pans. Fill the wells of the doughnut or muffin pans about 3/4 full (It won't take much batter to fill the doughnut wells). Bake the doughnuts or muffins for 10 to 12 minutes, or until a fork inserted into the center of one comes out clean. Remove from the oven, and after about 5 minutes, loosen their edges and transfer them to a rack to cool. Store at room temperature, loosely covered. They should last several days. Note: The recipe includes the added step of shaking the doughnuts in a bag of cinammon-sugar while they are still warm or, for the muffins, sprinkling the tops with cinammon-sugar. While that would have been tasty, I erred on the side of responsible parenting and skipped this step.